LONDON (CNNMoney) - Two of President Trump's top officials have landed in Davos, and they're already preparing the ground for their boss's big speech on Friday. 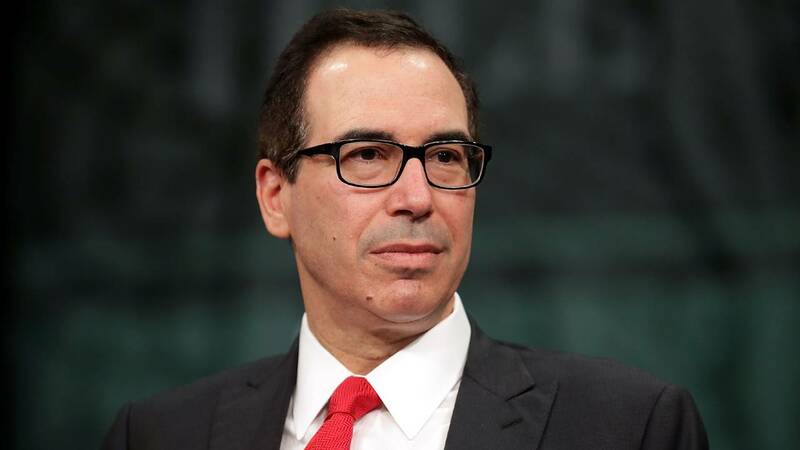 Treasury Secretary Steven Mnuchin and Commerce Secretary Wilbur Ross held a press conference at the World Economic Forum on Wednesday, fielding questions on everything from U.S. stock markets to trade with China. Mnuchin declined to preview Trump's speech, but he said the president's message would be true to his America First rhetoric. "This is about an America First agenda, but America First does mean working with the rest of the world," Mnuchin said. "It just means that President Trump is looking out for American workers and American interests -- no different than he expects other leaders to look out for their own," he added. Mnuchin said the U.S. administration "couldn't be happier" with the response to tax changes that cut the rate corporations pay. "I think you've seen already massive investment," he added. "The response from business has been even better than we expected." The changes have prompted many companies to bring cash held offshore back to the U.S. Others have handed out bonuses to workers. Mnuchin cited stock market records as a signal that investors are also pleased. "There is no question in terms of the vote from the market," he said. "The market is up a lot." The Treasury chief was asked whether U.S. stocks, which have set a series of record highs, are overheated. "What's happening in the U.S. is a reflection of the economic programs we've put in place," he said. "U.S. growth continues to look quite good, and it's a very attractive place to invest." Mnuchin said he wasn't worried about reports that China could slow its purchases of U.S. government debt. "It's not something we're particularly concerned with. I know there had been some press that was not accurate on this, but in all my conversations on this with my counterparts in China this is not an issue." Mnuchin also said the U.S. dollar, which lost 10% of its value in 2017, is not a short-term concern for the administration. "Obviously a weaker dollar is good for us as it relates to trade and opportunities. I think longer term the strength of the dollar is a reflection of the strength of the U.S. economy and the fact that it is, and will continue to be, the primary ... reserve currency." The dollar fell to its lowest level since December 2014 following Mnuchin's comments. It's highly unusual for a Treasury secretary to talk up a weak dollar, no matter how couched. At a White House press briefing Wednesday, Press Secretary Sarah Sanders walked back Mnuchin's comments a bit. She said the president believes in a free-floating currency, and she said the dollar is "stable." Trump slapped new tariffs on imports of solar panels and washing machines on Monday, a move that risks inflaming tensions with China. And the administration isn't done yet. Ross said that more trade actions are in the pipeline. "Many countries are very good at the rhetoric of free trade, but actually practice extreme protectionism. That is a problem with which the president is quite determined to deal." Ross said there are "a number of other actions pending" that relate to China, including investigations into steel and aluminum. Still, Mnuchin said that the U.S. was open to new trade agreements. "We are fans of bilateral trading agreements," he said. "We absolutely believe in free and fair trade, and anyone who wants to do trade with us on a reciprocal basis is welcome to do it."